'Picker' in American parlance is that hawk-eyed personage who trawls various junk emporiums in search of 'sleepers,' which in English slang are those valuables mole-eyed proprietors and their customers fail to notice. It might be shoes or frocks the picker specialises in. May be be watches, jewellery and bling. Records, books, cameras, kitchenalia, this, that, and the other, You name it, there's a picker out there who knows what's what but a thousand more who don't know their wozzats from their whatnots. Between the bedrock of knowledge and the topsoil of ignorance lies an inexhaustible seam of treasure that the picker knows full well others with deep pockets will pay high prices for but the ill informed will disregard. There's the picker's happy hunting ground. Judy specialises in homewares. She has the eye for rich fabrics, funky furniture, shabby chic plants pots and the knack with off-the-wall knickynackynoos. All of which go toward furthering her cause of making our home a more lovely place to live in, and in that quest she succeeds me because I'm blind to what works in that respect. I specialise in proper old school antiques because I have eyes for the form and the crucial detail — those little signs created by the process of making that prove in the absence of strident makers marks that a lovely shapely thing was made at a certain time in a certain place. And with me that's a time and place set in the middle distant past. Trawling the shelves I can't see a thing for some time. A million orphaned objects vying for loving homes takes a while for the eye to adjust to. So I go back round and round again until my eye gets in when I'm waylaid by a substantial pretty blue china piece, asking price, £3. I ignore it. Not knowing but suspecting it might be worth a punt I put it back, but only because I have no cash. We've not come here for the purpose of buying. I have a grand total of 17p in my pocket and Judy has left her purse at home. As I said. We hadn't bargained on finding such a place so we hadn't come prepared. And then, just as we decide we've seen enough, I go round again but this time with eyes adjusted to metals, when I see something I've always wanted to find but never have. Time and place — England, reign of George II. Fist gripped tightly round its elegant stem, I have to have it. But the price is one pound and that is a pound too much because I don't have one about my person. I walk about the place trying to figure out a strategy. Should I have them reserve it and come back later? I'm not about to put it back and have someone take it off my hands. After ten minutes of indecision I go to the car and mount a search for 'the lost piece'. By a miracle there it is beneath the passenger seat. At home I've quids 'aplenty. Now, my instinct says never leave behind what's pricked your picker's soul because minutes is what separates having a thing from not, and thirty or more have already elapsed. The nagging thought of that pretty thing in blue and white will not leave me and so I decide we must return. Judy is out the stalls before I am and off we set off armed with enough cash to buy a hundred things. She buys a stack. Linen, mirrors, wicker baskets, what have you. All stuff she'd spied first time around but hadn't the cash for. I buy a stack too. 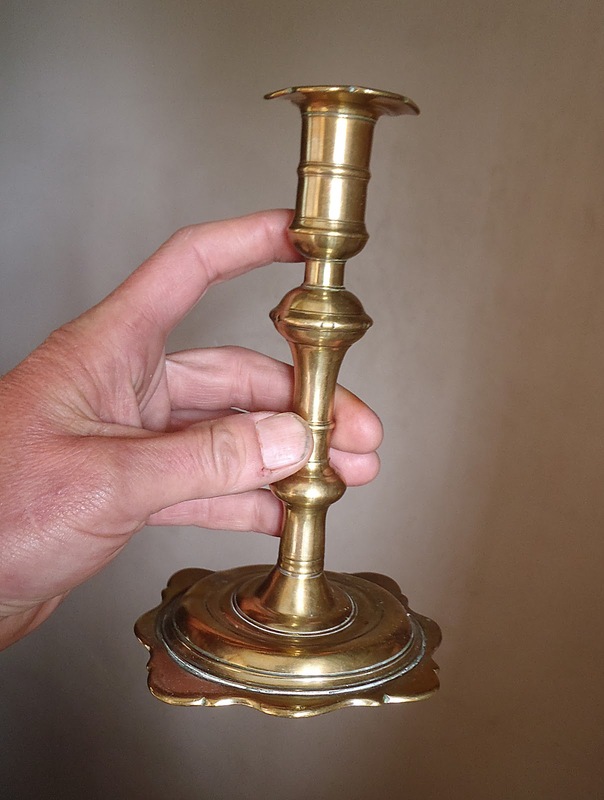 A pair of Arts and Crafts silvered planished copper candlesticks, damaged. A trio of onion scalloped porcelain tea cups and saucers with slop bowl — of unknown date — but very fine and handsome in plain white. This thing, that thing and the other thing too, but by sheer luck in amongst them all is my china piece. I thought I'd surely lost it, gone forever, but it was still there! Could a metal detector detect bullets in the air? Continually interesting metal detecting! Diggin' Scotland's Past!